Although Amber has the background of a well-off middle class family and private school education, she is all about equality and fair division of resources. The show introduces her as a fourteen-year old strong-willed girl who is risking her life to make sure a child won't get captured by the Locos and changes her plans of leaving the looted city to make sure she is safe. Amber has a sense of assurance and holds herself straight and tall. She gives off confident vibes left, right and centre and makes sure everyone knows she is not scared of whatever is coming, although often it's a 'fake it til you make it' attitude. In the Mall, her strength and resilience come through when she often has to take a stand against the whole group to make them see sense and work together. Amber is a quick and logical thinker. She assesses a situation and tries to reach the best decision for the whole group. She is strong-willed yet can be very vulnerable sometimes when she lets her feelings cloud her judgement. She's fiercely moral and this leads her to sometimes be too hard on everyone, herself in particular. She's very down to earth and does what needs to get done, also expecting the same attitude from others. Very determined not to fall in love, she actually later admits she 'wanted' Bray from the moment she first saw him and, despite several obstacles including Amber's 'death' on Eagle Mountain, their relationship survives and they later have a child together. Bray and Amber meet early in Series one, and there is an instant chemistry between them. Even though at first they are denying their feelings for each other. Amber is certain Bray is after every girl but her and also determined not to get herself hurt, which she admits to Tai-San. When Sasha comes along and unlike Bray, really lets her know how he feels, Amber has nothing to lose and starts a relationship with him, making a short-lived escape to the beach where Sasha tries to convince her to leave the Mall. In the end Amber isn't ready to leave her Tribe and she returns to the Mall. Various events such as the fear that the virus has been reactivated and the threat of Tribe Circus help Amber and Bray finally admit their feelings for each other and become a couple. Hot cocoa is a factor there, too. They are happy until the explosion on Eagle Mountain. 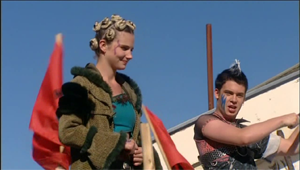 In series three, Amber is found living with and leading the Gaians. It's explained that Ebony has tricked her into believing that she and Bray had a baby together and conveniently told the rest of the tribe that Amber was dead once she lost consciousness on Eagle Mountain, making sure no one found her. Amber is later discovered by Pride and brought to his tribe. Pride calls her the 'heart and soul' of his tribe, but eventually Amber chooses to return to the Mall Rats, her old lifestyle and love after helping them defeat the Chosen. It's no surprise she and Bray grow back together, they have been soul mates from the start. As Amber is about to give birth to their baby, Bray is taken away by the Technos invading the city, so Trudy helps deliver Amber's baby. After christening her newborn and naming him 'Bray' Amber decides that she wants to raise her son with the Gaians, away from the warring tribes. She gets briefly captured by the Technos and submitted to Reality Space experiments, but the Mall Rats and Pride break her out of their facility and she even tries to warn the city with a rebel broadcast, only to be shut down by Ram and she goes back to the Ecos. Once Jay and Ebony find her tribe while trying to escape the city, Jay convinces her to return and fight. Amber has softened through being a parent and she has found her maternal side to be quite strong, making her more determined to build a better future for her child's sake. Amber loves her son deeply and loves watching him grow, but as a leader often has to make the choice to spend time away from him. After the Technos under Ram's leadership are defeated, Amber decides that she has to know what happened to Bray. She is devastated to find that Bray is on the 'deleted' list, and initially uses this as a reasoning that she and Jay could never be together. Amber has constantly been drawn between two ways of life - the Gaians and the Mall Rats - but recently she had to choose Mall Rats permanently. Amber is the one who travels back to the Gaians to deliver the sad news about Pride's death. After this final blow, Hawk tells Amber that she is no longer welcome at the Gaian camp. Amber finally decides that she wants to give Jay a chance and he never mentions that he and Trudy are now together. Amber finds out when she walks in on the two of them and this causes Amber and Trudy's friendship to almost break apart. Jay eventually chooses Amber, and the girls manage to mend bridges after Amber's life is endangered following a fall she takes while trying to make a Zoot-crazed crowd listen to her. Whenever a message needs to be spread across the city, Amber is usually asked to do it, mostly because of her leadership skills and ability to get a message across clearly. She's good with words and able to inspire a crowd with her speeches when necessary. Working from the inside, Amber helps defeat Mega's regime. On the surface working with the Technos does not bring her a lot of support from the city dwellers. Eventually Amber is seen openly supporting the rebels and works with Jack, Lex and Ebony and the rest of the rebels in Liberty to get their city back. Unfortunately, Ram activates AI Zoot who has an agenda of its own and activates Mega's biological warfare systems, this prompting an explosion in the city, and the Mall Rats have to make a rushed escape on a boat, leaving their old life behind and heading to unknown. Amber's tightly wound Zulu knots can give her a harsh edge and her Eagle styles weren't what would commonly be seen downtown, but she still manages to get away with showing that she is one of the most confident chicks around. Amber's make up relies heavily on black mascara and an eyeliner. For eyeshadow she chooses gold and orange pinks, often wearing the eyeshadow all the way down to the cheekbones. Her lipsticks vary from tinted glosses in pink or orange to a green lipstick for a short period in series one. She always wears tribal markings on her face, indicating where she belongs throughout the series. She wears her hair in Zulu knots of variable styles and sizes, sometimes decorated with brown or blue feathers or ribbons for special occasions and parties. Mid series one Amber lets her hair down - literally - still having them sectioned off, but coming down in blond curls. During the second half of her pregnancy, Amber wears her hair in curled ringlets, softening the whole general look and feel of her style, but once the relatively peaceful time in the Mall ends, she goes back to her trusted Zulu knots style. Amber prefers clothes that are easy to maintain and move around in and her clothes have a strong, modern look to them. In series one we see her wearing dark leather and layered jackets a lot, she seems to generally prefer 3/4 length leather pants combined with combat boots. Her first outfit is a short brown suede leather vest with a panelled front and splits on the sides, done up with a zip on the back. Along with that, she wears high waisted dark blue jeans with pockets and black combat boots and a long black trench coat style denim jacket. The jacket comes with unzip able arms and it can also be turned into a short jacket we see Amber wearing midway through series one. Once she gets more settled into the life in the Mall, Amber has got a little more time to think about her appearance and style and she picks a top made of dark green leather. It's adorned with a big buckled belt. Going full-leather, Amber also wears tight fitting 3/4 leather pants that later become her trademark. Each leg has a seam down the front and there is actually a peace sign patch across the left thigh. She also wears a blue necklace with silver peace sign on it. In season three when we meet Amber again as Eagle, she wears a truly fitting costume. A large skirt adorned with white, brown and blue pheasant feathers sewn onto blue satin and a matching feathery shoulder cloak. Underneath it, Amber is wearing a blue mesh top and light blue leather corset with an armour of snakelike pattern. The neckline has also been adorned with light blue feathers. One the back, the corset is done up with a blue cord. She is also wearing matching snakeskin pants and once Amber makes it to the city, she switches her feathers to a military style grey woolen coat, adorned with pheasant feathers on the shoulders and paua shell buttons. The style is completed with blue painted boots. Amber doesn't wear dresses often, but she makes an exception for a special occasion once all the fighting is over and both she and Trudy have decided to become Mall Rats again. She wears a snakeskin print orange Lycra dress with blue spaghetti straps and cut off sides. The front of the dress is short, but the back has more fabric, coming below the knees. She is also wearing blue Lycra shorts and a blue crocheted singlet, secured to place with a metal clip. As for accessories, Amber also has long blue arm sleeves with large metal arm bands and a silvery metal choker. Her boots are black and come up to the knee. Towards the end of series three, with her growing pregnancy, Amber makes a few adjustments to her style, ditching corsets, but she keeps wearing red leather pants, 3/4 in length and with red cords on both sides of the waistline which makes it possible to adjust the pants with the growing belly. She's wearing a pink patterned sleeveless tube top made of stretchy fabric and on top of that a short dark blue satin vintage bra let, with cups sewn in 1940s pattern and double straps. Her only accessories are small silver earrings and a matching silver necklace. By series four, Amber is back to living with the Gaians and it also reflects in her style, but she still prefers leather when it comes to outfits. She's wearing a turquoise coloured leather top/corset, again with peacock leathers sewn along the neckline. The top has an interesting asymmetrical cut and belt detail. Amber's pants are again 3/4 pants made of brown leather which come to just below the knee with a low cut on the hips. Amber loves practicality and pockets and these pants are no exception. Pockets, pockets everywhere. Amber is also wearing a wide brown leather belt. Completing the look, is a full-length velvety jacket in dark green and black colour. The jacket has two big pockets (of course) and is done up with big buckles at the front. It looks really warm and comfortable with a large hood and flared arms, with the trim made of rabbit fur. Amber has few accessories to go with this outfit, lovely little rainbow colored hook earrings and a size able paua shell necklace, combined with copper wire and colorful beads. She's also wearing brown patchwork leather platform boots that are durable in any weather.